When planning a meeting, an event or activity, we deal with many individual steps (each taking certain amount of time). Today let us understand how to create an agenda template in Excel using simple formulas. Enter the start time of the first activity. In fill up durations for all activities in minutes. So the formula for end time cell is =start-time + duration-minutes / 24 / 60. The start time for subsequent activities is equal to end time of previous activity. Fill down the formulas and your agenda template is ready! It contains a ready to use agenda template with built in formulas. 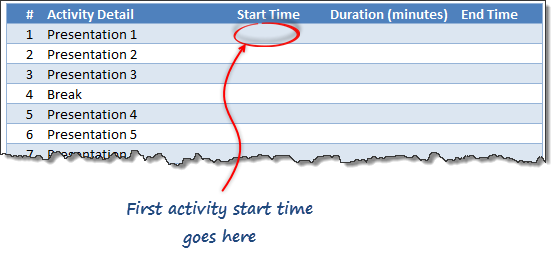 The template also highlights any activities marked as break in different color using conditional formatting. If you like this agenda template, you are going to love these other templates too. This template is inspired from a question emailed by Renuka, one of our readers. The template contains merged cells!! In this day and age, there is no need for merged cells. Ever. I disagree. There is no harm in having a merged cell in a simple workbook like this. Even in complex workbooks, I rarely notice any performance or macro coding issues with merged cells. Although they may cause certain problems, you should not worry about them unless you are doing some heavy duty programming or constantly referring to merged cells thru your code. I used it in this template for cosmetic reasons alone and I feel going thru format cells > alignment > center across selection is un-necessary steps for something simple like agenda template. I understand why people merge cells, it looks better. But when you go to select one column some 150 rows lower it is maddening that four are selected because of a merge & centre elsewhere! Given that 'centre across selection' (from the ctrl + F1 menu, alignments tab) does exactly the same job, merge & centre should be avoided at all costs. I think that was what Yard was hinting at!! When cell E7 is selected, a comment box pops up. Can you explain to me how that was done? This can be applied via Go to Data Ribbon, Than Data Tools Tab, Click on Data Validation. A window will appear Select Input Message Tab and Write your Message in "Input Message Box". Click OK to be applied. When i click on E7 Cell a box pop up can i know how its been done. It makes it easier to see that there's a time calculation being made, and just what is being done. Hello! I work in a role that's constantly used for planning big and multiple meetings any given day. I actually created this exact agenda on my own, but I've always had trouble with sorting. I have researched various blogs and excel sites to figure out how to retain formula/data integrity when sorting on the agenda item #. 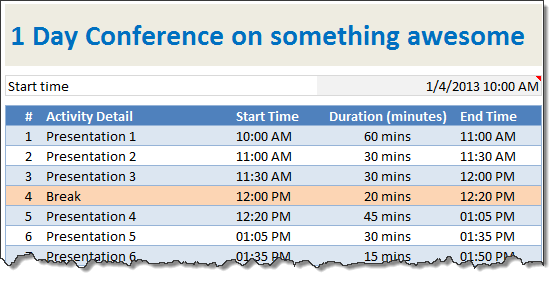 Things are bound to change at the last moment, so I'm trying to come up with a solution when I have to reorder agenda items but ensure meeting times still reflect accurately based on duration and end times. Any suggestions? for the United States national women.